Dreamstime. Ice cream is our favorite food, so we look for special ways to celebrate in July, National Ice Cream Month. First, we treated ourselves to three pints of Jeni’s Splendid Ice Creams, at $12.99 per pint. We found them in a specialty food market in New York City: Columbus, Ohio-based Jeni’s has begun distribution to specialty stores nationwide (see the store locator on the Jeni’s website). Jeni’s sells pints for $12.00, but the extra 99¢ was far better than the alternative of paying $65.00 in overnight shipping to get them from Columbus. Jeni’s Splended Ice Creams are indeed splendid. Flavors such as Goat Cheese With Cherries and Sweet Corn are burned into our memory as the best ice cream we’ve ever had. The high price reflects the quality of the ingredients—it’s impossible to use better ones. You can taste the distinctive flavor of the local, grass-fed milk and cream. But budget is a consideration for us, so for less than half the price, we’ll stick to Talenti Gelato. Both were NIBBLE Top Picks Of The Week (here are our reviews of Jeni’s and Talenti). But to our palate, Talenti Gelato is the best price-value ice cream out there: superpremium ice cream without the superpremium price. For ice cream devotées, Jeni’s is a must-try. If there’s no Jeni’s near you, pick up a copy of Jeni’s ice cream cookbook. Next, in honor of National Ice Cream Month and some very fruity Olave olive oil from Chile, we made our own ice cream: olive oil ice cream. (Fruity is just one of the flavor profiles of olive oil. See the others). If that sounds unusual to you, it was a new concept to us as well, when we first tried it in 2004. The occasion was the opening of Mario Batali’s pizzeria, Otto, in New York City. There was much to explore on the menu. In a basic custard base, olive oil substitutes for some of the heavy cream. There are as many recipes as there are recipe tweakers. Emeril Lagasse, for example, uses fewer egg yolks but amps up the fat by using half and half instead of milk. He also adds a teaspoon of vanilla extract. You can do your own tweaking to find your ideal recipe. 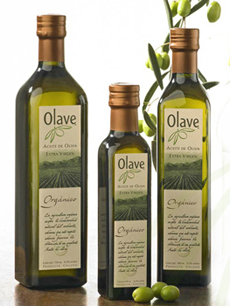 Olave is a fruity-style olive oil from Chile. You can buy it online. Photo courtesy Olave. *We used fruity organic olive oil from Olave. You don’t want to use a peppery or grassy olive oil. See the different olive oil flavor profiles. 1. Warm the milk, sugar, and salt in a medium saucepan. 2. In a separate medium bowl, whisk together the egg yolks. Slowly pour the warm mixture into the egg yolks, whisking constantly. Then scrape the warmed egg yolks into the saucepan. 3. Stir the mixture constantly over medium heat with a heatproof spatula, scraping the bottom as you stir, until the mixture thickens and coats the spatula. Turn off the heat when the custard just slightly thickens. 4. Pour the cream into a large bowl and set a mesh strainer on top. Pour the custard through the strainer and stir it into the cream. 5. Whisk the olive oil into the custard and cream mixture until it’s well blended; then stir until cool over an ice bath. 6. Chill the mixture thoroughly in the refrigerator, then freeze it in your ice cream maker according to the manufacturer’s instructions. Yield: 1 quart. 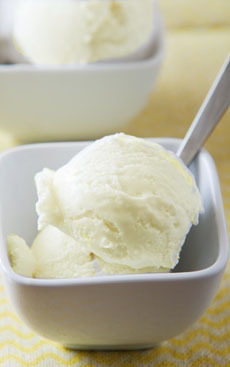 If you don’t want to make olive oil ice cream from scratch, use fine olive oil as a topping for vanilla ice cream. Drizzle olive oil over the top, as you would a syrup. Garnish with a pinch of coarse sea salt (for a salty counterpoint plus crunch). Pink Himalayan sea salt is especially lovely, as is the pyramid-shaped Maldon salt, which is also available in a wonderful smoked version.